I have a hunch that every one of us in this room has a deep longing for something. And I don’t mean a longing that the Vikings would win more games. Or are longing to take a nap. I think if we really thought about this, we would find some deeper longings inside each of us. Maybe you are longing to find that special someone in your life. Or, maybe you had that special someone and you have experienced the grief of loss, and there is a longing for that person’s presence. The holidays are often a time when the grief of losing a loved one is amplified. Or maybe your family is geographically scattered, and you long for a time when you can be together. Or perhaps there struggles that you are going through, and you simply long for a better time. This is the second week of Advent, and we call this week’s candle on our Advent wreath, the candle of preparation. Last week we lit the candle of waiting. Both waiting and preparation, share this thing in common called longing. Advent is about longing for something. IN our first reading this morning from the book of Joel, we learn something about our longings. The story of the Old Testament is that the people were taken into exile, forcibly removed from their homes and resettled in a foreign country, first by the Assyrian army, then by the Babylonian army. Everything had gone wrong for the people of Israel. They were far from home and far from God. And then, in the 6th century B.C., the Persian Empire took control of all those lands, and King Cyrus of Persia allowed the people to return to Jerusalem. This was good news! People had been longing for the day that they might return to their homeland, and now that day has arrived! The people get to go back to their homes! Their longing was about to be realized. Everything would now be wonderful, right? Have you ever felt like that? Do you ever look around and think, what is going on? Why is the world such a violent place? Why are there hungry children, and why do countries continually bomb each other and fight over land and money and power? We ask these questions because, deep down inside, we know it shouldn’t be this way. We long for something more; something better. This Christmas season is a time to open our hearts to God. “Rend your hearts and not your clothing,” says the prophet Joel. People in ancient Israel would tear their clothing as a sign of their sorrow over their sin. God is saying, “I want to open your hearts, not tear your clothing. Open your hearts to me.” How do we do that? And this is where the prophet Joel comes on the scene. 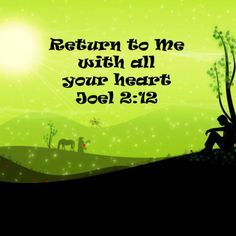 And the prophet Joel tells us that this longing can only be fully answered by returning to God. And in our reading from Joel, we are given two pictures of God’s call to return to him. I want to label these two pictures of returning to God with two key words – Repentance and Homecoming. It starts by realizing what God does for us. Notice that word “relent.” The word “relent” means to repent, to change one’s mind. Except here it is God doing the repenting, it is God changing his mind. But it always seems a little out of place in our culture, to hear the call to ‘repent’ during the Christmas season because we’re told this is a time of the year to be jolly, and not a time for self-examination and making changes in our lives. When I was in college, Christmas was a time of returning home, to Golden Valley, a suburb of Minneapolis. I remember looking forward to the Christmas break. I remember looking forward to the comfort and security of my room and familiar surroundings. I remember looking forward to seeing friends I hadn’t seen in so long. But what I experienced in those trips home was the slow realization that things had changed. My friends didn’t all come home, and the ones that did, often had other plans. My parents, enjoying their empty nest years, begin to travel more and weren’t always home when I came home. My dad was talking about early retirement and selling the house and moving. The high school I had attended was getting ready to close, in a consolidation with other schools. What should’ve been such a joyous time, those trips back home felt more like sadness and longing. And I had a growing realization that I needed some direction, some guidance in my life, to navigate the changes. It was similar for the people of Israel so long ago…. Expectations of a joyous return to Jerusalem, only to come to the realization that things had changed. Hunger, violence, and fear was their new reality. And those realities brought on a sense of sadness and longing, and a sense that they need direction, guidance, help to navigate the changes. But God speaks into that darkness. It was a reminder to the people that God had not abandoned them. God’s call to return is a call for people to “come home” – not in the sense of returning to a particular town or geographical location – but to a relationship: a relationship with God who loves lavishly and constantly, and who deals with us in grace rather than punishment. And contained within this call to come home to God, is a promise that there will be a new future, a future with hope. God says, through the prophet Joel, “I will pour out my spirit on all flesh.” There is a future where the people will sense God’s closeness to them, guiding them, helping them, and reassuring them that he has plans for their future. Advent is a time of repentance, a time to come home to God, and with that coming home to God is the promise that God, in his grace, and in his time, will make all things right. In the midst of the disappointments and struggles and longings of our lives, may we hear God’s call for you…to “come home,” to the one who is the Light that shines in the darkness, to the one who is born among us and promises to fill us with his grace and love.